MIMC is a progressive Consulting and Development firm specialized in the field of Project Development Management and Project Investment Financing. Based in the UAE since 2006, MIMC combines industry-specific managerial experience and consulting competence with extensive process, technology and regional practice know-how. With our expert experience we are able to advise our clients throughout the entire value chain, from market analysis, strategic project development to process optimization, financing, research and development, construction and project management. We have a strict adherence for quality of services and to the ethical principles of conducting business. MIMC has extensive experience in abiding to the local standards of Quality Sustainability Assessment System (QSAS). Our company experience and expertise is an asset to our clients and results in impeccably executed projects. Technology and regional best practice know-how along with our expert experience enable us to advise our clients throughout the entire value chain. We can guarantee quality by enforcing strict adherence to quality of services and to the ethical principles of conducting business. Our engineering strengths focus on: Procurement, requests for proposal, tendering and contract negotiation, relationship management with governing authorities, codes and regulations, innovation technologies, design review, NOC's, QA/QC and cost control. Whatever challenge your project might entail you can trust our team's outstanding skills and dedication to make your project a successful enterprise. Our talented professionals at MIMC lead our clients through the realization of the most complex projects each step of the way. Let us put you on the fast track to successful project execution and challenge resolution by calling or inquiring over our services today. The process of tailoring perfect projects for our clients needs and expectations starts with the project definition and conceptual plans. Our team will use outstanding knowledge of the region to assess the market and conduct a feasibility study to establish a reasonable budget for the project. Only after receiving approval will our team authorize project development and allocate responsibilities. The process of project planning entails establishing WBS, project organization, plan management and a procurement plan. Consequently the project master plan will be developed with its phasing strategy. During the phase of project design MIMC will guarantee a concern free state of mind for our clients managing all processes including data collection, design criteria, regulatory authorities and coordination. 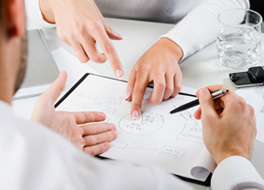 Concept design activities will enable our team to provide clients with precise cost estimates. We facilitate the process of schematic design, packaging and authority MOU's. Following these steps the design for the project is developed, approvals from authorities involved will be received and the building permits granted. The tendering process can now start to allow our team to lead the project into its execution phase. Our team will use its extensive network to sort out contracts and negotiations. Following this step is the contractor's management plan and program. MIMC will take charge of contractor's logistics plan, suppliers subcontractors and histograms. Additionally we will deal with shop drawings, HSE, QA/QC, construction process RFI's. We will assess the need for eventual variation and resolute any possible dispute to the client's satisfaction. Finally our team will run the testing and commissioning, snagging and will perform all practices for project handover.